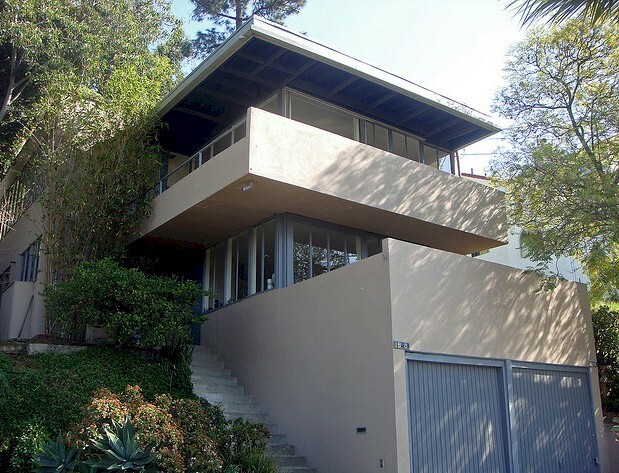 Located at 1816-1818 Silverwood Terrace in Silver Lake, this 1,620 sf duplex with cantilevered porches was originally built in 1937 for art professor Harry Koblick at a cost of $8,500. The top unit is 2 bedrooms and 1 bath overlooking the Silver Lake reservoir. The lower unit sits above the garage and consists of 1 bedroom and 1 bath. The units are currently renting for $1,180 and $1,890 respectively. The duplex is currently listed with The Agency for $849,000. Duplexes are a great way to get into the Silver Lake real estate market. View Larger Map The only interior photos available with the listing appear to be from a magazine. The quality isn’t good enough to show here. If you’d like to see this Neutra duplex, give me a call and let me know what day and time works for you: (213) 215-4758. Jenny Durling Broker Associate L.A. Property Solutions 213-215-4758 info@LApropertySolutions.com LApropertySolutions.com Copyright © 2011 By Jenny Durling *Neutra’s Silver Lake Duplex is Back on the Market!